Ramen with a clear broth is the standard approach that has won the hearts (and stomachs) of diners the world over, but try it with a rich, creamy coconut milk base instead and you may just find yourself with a new favorite. 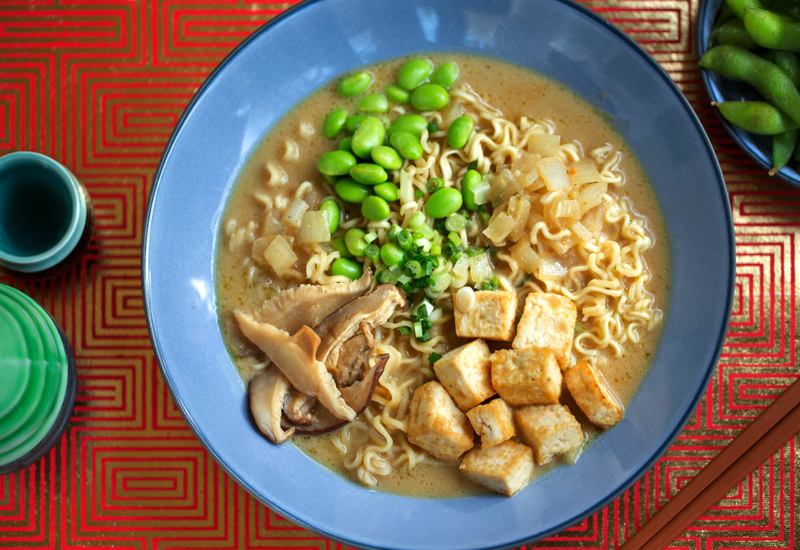 This vegan soup is comfort food at its best—the rich broth is filled with seared tofu, edamame, and al dente noodles. Miso and dried shiitake mushrooms add an umami earthiness and depth. Call it fusion, call it evolution, or just call it delicious; this quick-fix recipe may just change the way you think about the humble curly noodle. For best results, use fresh ramen noodles, which can be found at Whole Foods, Asian grocery stores or gourmet markets. In a pinch, dried ramen noodles will still give you good flavor but don't have the same great texture. Feel free to add the steamed vegetables of your choice for more nutritional value. Per Serving: 819 calories; 65g fat; 45.1g carbohydrates; 23g protein; 0mg cholesterol; 3087mg sodium. This coconut ramen was delicious! Such an upgrade from packaged ramen that I ate back in college. I also really enjoyed the creaminess from the coconut milk. Such a good addition! I love this ramen! Seriously the best ever. The creamy coconut broth is extra rich and delicious. This is a really filling dish, the only thing missing is a soft boiled egg, which I added. So yummy. I skipped the white miso paste, couldn't find it at the store. Also, I had to use dry packaged ramen because there is not a Whole Foods where I live and I couldn't find fresh ramen. Still, I thought this recipe was delicious. I loved the creamy coconut flavors. I used plant milk and chopped cremini mushrooms instead of shiitake. It was pretty good, but next time I want to use coconut milk. Yummy! I added a soft boiled egg to this creamy ramen soup, it was really good. Definitely better than the crap I used to eat in college.